Density of air varies with temperature and pressure (or altitude and elevation above sea level) and a fan will not deliver according manufacture specification if the operating conditions are outside the NTP - Normal Temperature and Pressure Conditions. NTP - Normal Temperature and Pressure Conditions - 20oC, 101.325 kN/m2, 1.204 kg/m3 (68oF, 29.92 inches Hg, 0.075 pounds per cubic foot). A fan is a "constant volume" device where the volume in the fan - and the transported air volume through the fan - always is the same (with the same speed and size of the fan). Since the density of air varies with temperature and pressure the mass flow through a fan varies with temperature and pressure. When selecting a fan it is important to know if the specification of the system is based on operating conditions or NTP conditions. The formulas below can be used to calculate the volume flow, pressure head and power consumption at NTP conditions if the operating conditions are known, or vice versa if the NTP conditions are known. The volume through the fan is constant - but the amount of air passing through the fan varies with temperature and air density/specific volume. The volume, pressure and power ratios are expressed in the chart below. The chart is based on a NTP reference with temperature of 20 oC. The calculator below can be used to estimate the volume, pressure and power ratios at different temperatures. The default values are based on NTP conditions. A fan delivers 10000 m3/h of hot air at 60 oC. The total pressure loss in the system at this volume is estimated to 500 Pa. 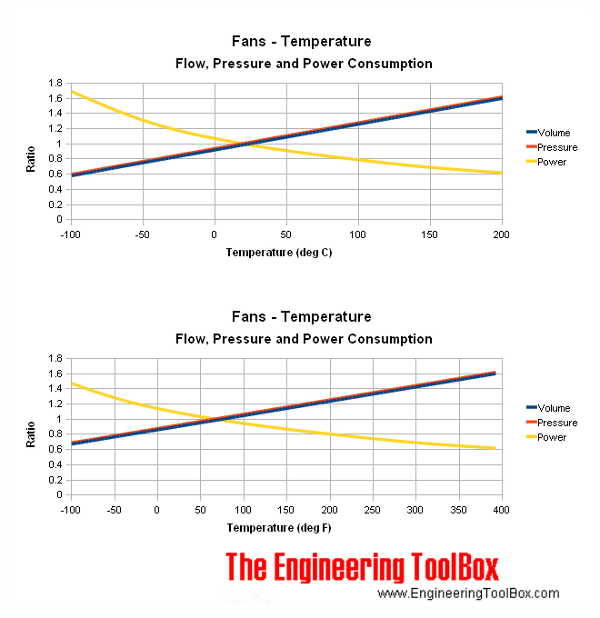 Decide the correct air volume and pressure for choosing a fan from the manufacturers data. Decide the power consumption. Since the air volume is estimated for the hot air, the correct volume for the fan is 10000 m3/h. Note! - do not compensate the pressure developed by the fan if the pressure loss in the system is estimated on the basis of normal charts based on air with density 1.2 kg/m3. 10000 m3/h of normal standard air at 20 oC shall be transported at an operating combustion air temperature of 180 oC. The total pressure developed at 180 oC is estimated to 500 Pa. Decide the correct air volume and pressure for choosing the fan from the manufacturers data and decide the total pressure for selecting the fan! Note! - the power consumption is lower in operating condition than during start up. A motor (and the motor protection) should in general be big enough to handle higher start up power consumption. Remember! If a fan starts with temperatures below 20 oC (NTP) - the power consumption will be higher than specified in the catalogue - and the fan may be stopped by the electrical overload protection. The power consumption during start up can be reduced by limiting the volume flow with a closing damper on the outlet of the fan. Engineering ToolBox, (2003). Fans - Air Temperature and Volume Flow, Pressure Head and Power Consumption. [online] Available at: https://www.engineeringtoolbox.com/air-density-temperature-fan-capacity-d_144.html [Accessed Day Mo. Year].